While Lexi did not immediately bounce back to full undead health under Kyle’s protective umbrella, she did seem to perk up a bit. The skies were looking cloudy over Newcrest when they arrived back. At first, this was a relief to Lexi and the others, who had also started to feel the effects of the cocktail wearing off. 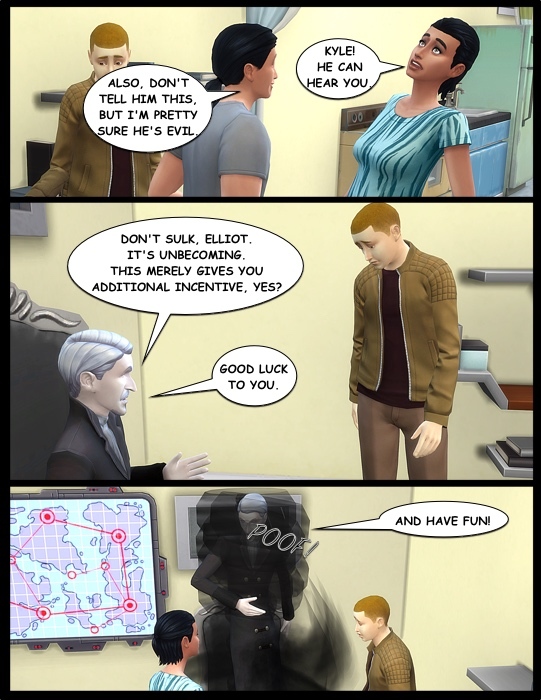 But then Elliot noticed something peculiar. While all of Newcrest was shadowed by the heavy clouds, their heaviness seemed particularly concentrated over his home. And as we all know, nothing says “ominous presense” like a group of clouds gathering unnaturally above one’s living space. Elliot’s uneasy feelings were confirmed as he opened the door. Unless Elliot was mistaken, Max was the youngest member of the Villareal family. 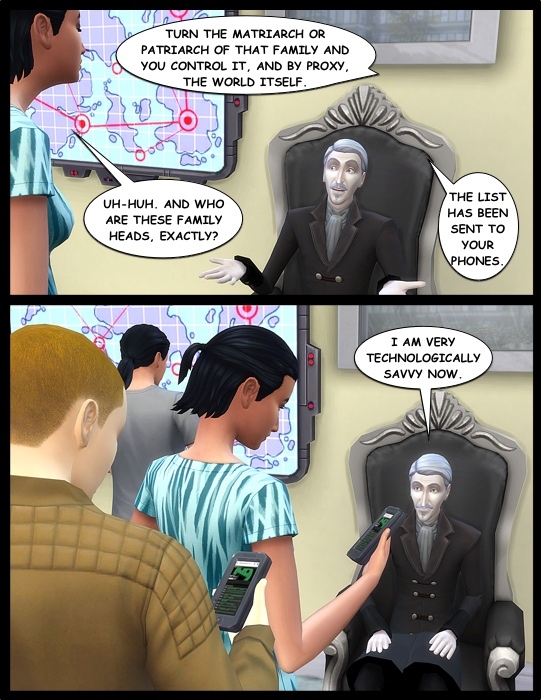 How was a child the key person of influence in all of Windenburg? 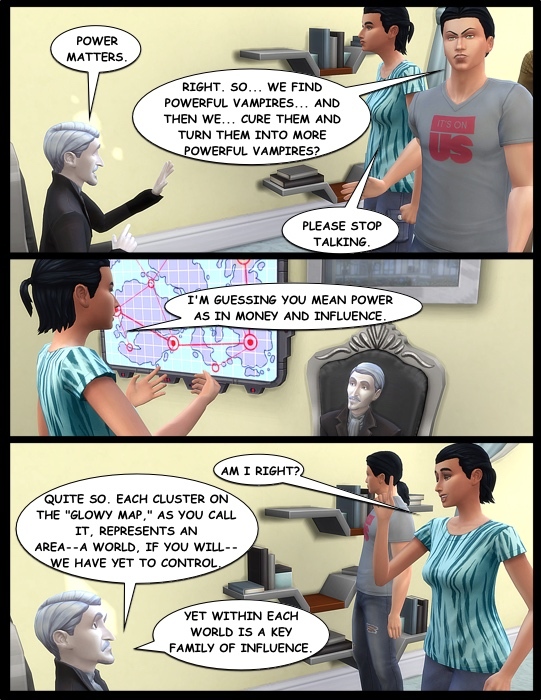 Still, Vladislaus assured them all that Max was a terrifying force of nature and not to be underestimated. Lexi and Kyle also looked over the list carefully and noticed their own oddities. Feeling overwhelmed, Elliot collapsed into the dark, unwieldy throne Vladislaus had not bothered to take with him when he vanished. This was not how things were supposed to go. True, if one had asked Elliot what he thought creating a vampire clan entailed, he certainly would not have called it a fun-filled safe adventure. Yet neither had he paused to contemplate what the non-safe parts might involve. Now he was stuck. 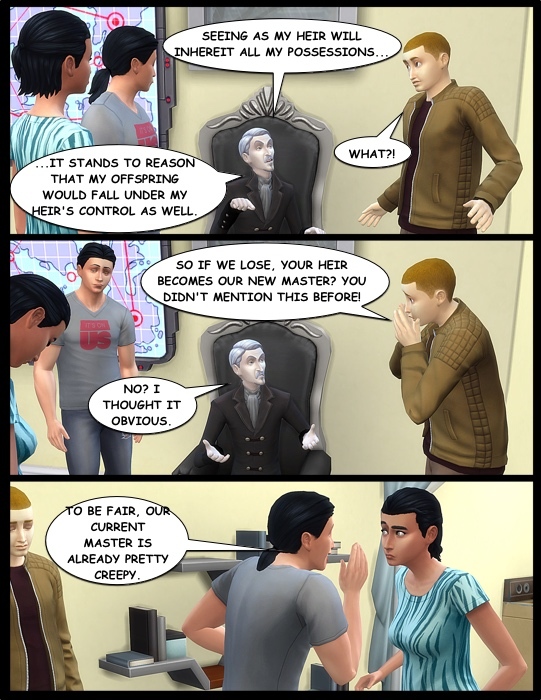 Having Vladislaus as a master was tolerable. 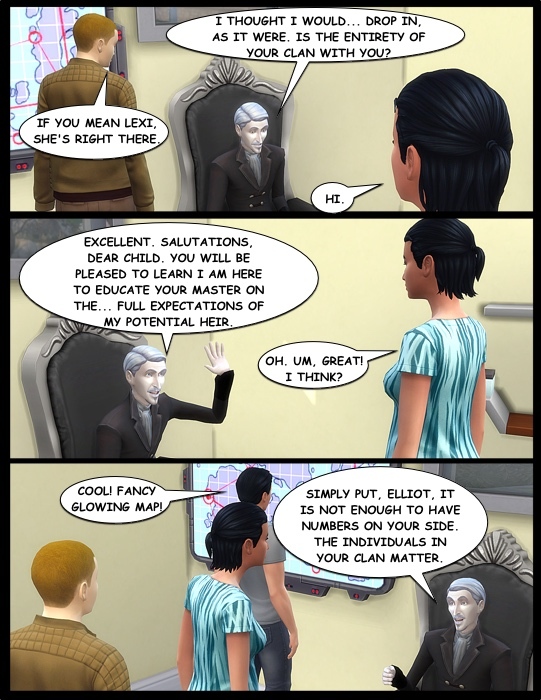 As the old vampire had admitted, he had become quite lax and was more or less content to let Elliot go about his business. Who knew what his offspring were capable of, though? And worst of all, he’d entangled Lexi in this mess, too. He felt especially bad about that. It was unclear where Lexi’s hesitation was coming from. But as long as they were in this together anyway, Elliot did not push the matter. He and Kyle (or preferably he and not Kyle) would address the other people on the list. 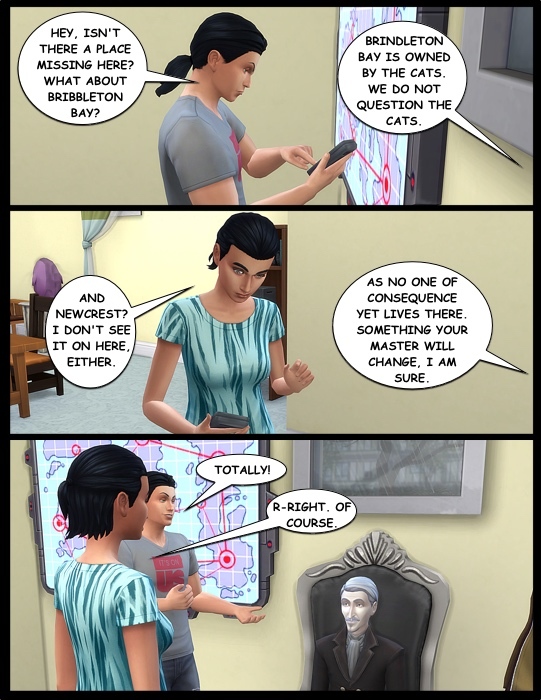 Lily Feng would be left to whatever Lexi’s plans happened to be. 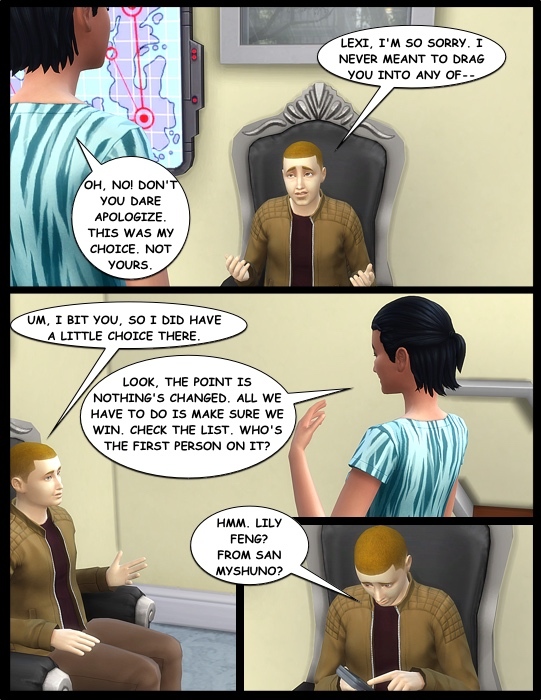 Tags: Clanbuilding for Dummies, Comics, Sims. Bookmark the permalink. 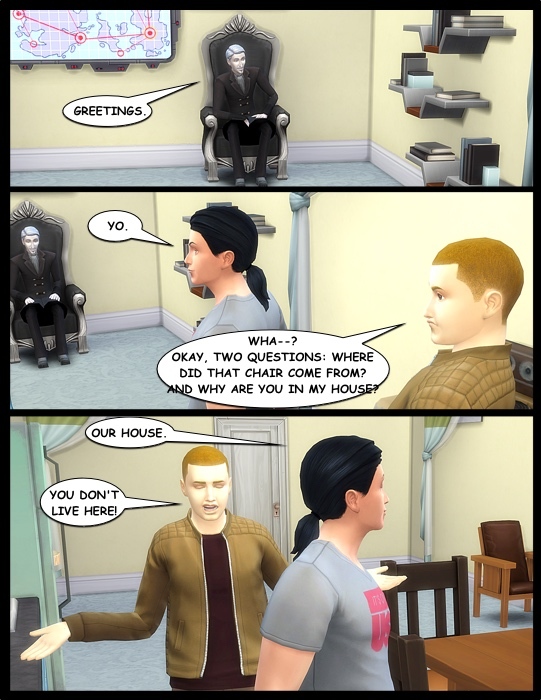 Love that Vlad brought his own throne with him. Nice touch. So, now we have specific targets to be brought into the clan, and the clock is ticking. These guys certainly have their work cut out for them. 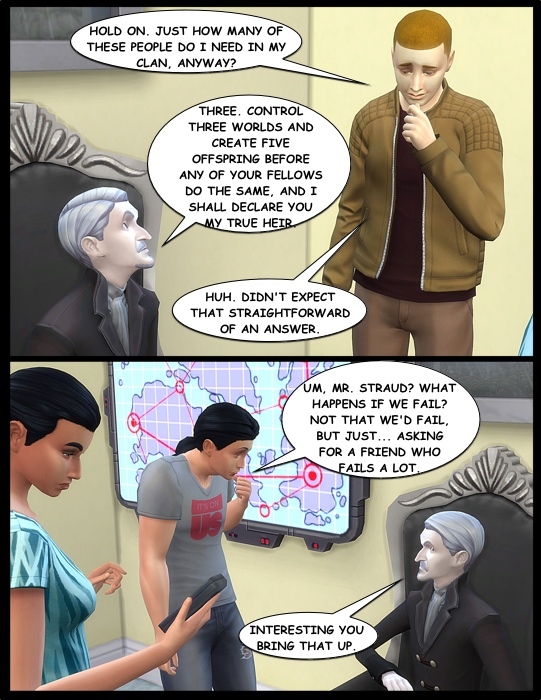 Kyle continues to crack me up with his clueless blundering. I wonder if Lexi used to be Lily’s housekeeper? She seems to be intimidated by the thought of seeing Lily again. He-he. 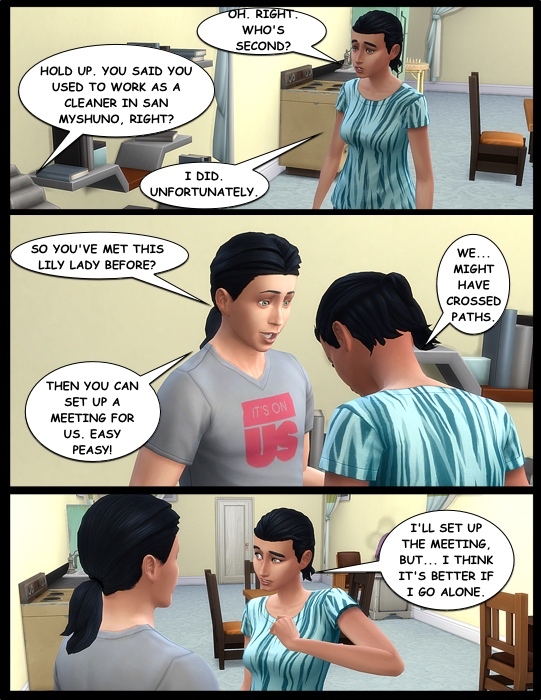 Well, I know you already read the next chapter, but yes, good call on Lexi and Lily’s relationship.